New York State Assembly Member represents the 73rd Assembly District in Albany. 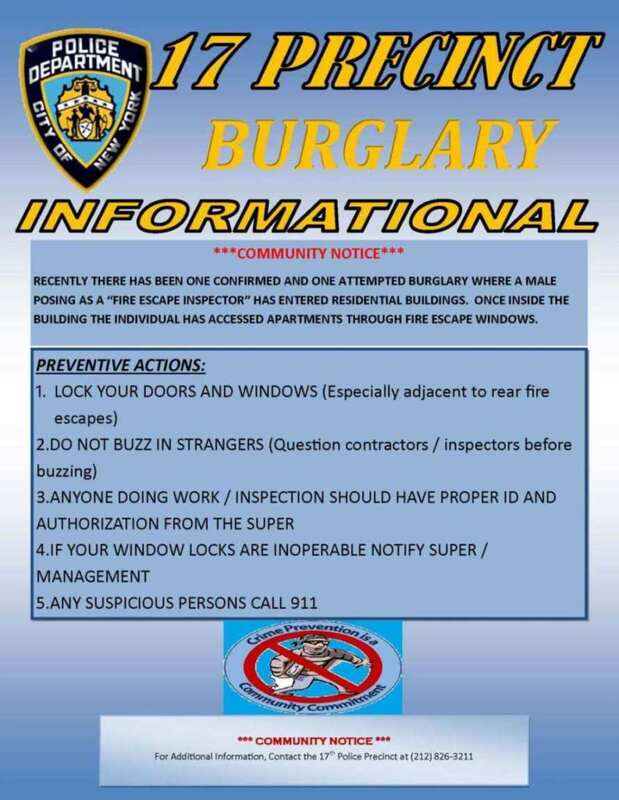 The NYPD 17th Precinct is located in midtown Manhattan and comprised of the following communities: Sutton Area, Beekman Place, Kips Bay, Turtle Bay, Murray Hill, Manhattan East and the Rose Hill Community. The Precinct serves three main constituents - residential, business and diplomatic communities. The Precinct Council meeting is held on the last Tuesday of every Month at 6 P.M. at the Sutton Place Synagogue, 225 East 51st Street. Adopt-a-Basket Program - Volunteer to help keep NYC clean! The NYC Department of Sanitation (DSNY) is seeking participants for a program that will keep our streets clean. By volunteering for the Adopt-a-Basket program, you will be ensuring that a trash receptacle near you is properly maintained and will not overflow. Here’s how it works: DSNY provides a supply of plastic liners, a collection schedule, and a direct DSNY contact at its local office. To help, monitor your litter baskets; when they are three-quarters full, remove the used plastic liners, tie them, leave them next to the basket and insert a new liner. It’s easy to register - just visit nyc.gov/adoptabasket and sign up to help us keep New York City healthy, safe and clean. State Assemblymember Harvey Epstein represents the East Side of Manhattan, including the neighborhoods of the Lower East Side, East Village, Alphabet City, Stuyvesant Town/Peter Cooper Village, Murray Hill, Tudor City and the United Nations. Get information about important voting dates, candidates, polling places. etc. On Election Days, polling places are open 6am to 9pm. You can also view a sample ballot showing the candidates from the polling place locator. The 2nd Council District which includes the diverse neighborhoods of the East Village, Flatiron, Gramercy Park, Rose Hill, Kips Bay, Murray Hill and the Lower East Side. She was elected to office in 2017 with 83% of the vote, and has established herself as a leader on many issues, including affordability, preservation, open space, resiliency, education equality, and small business survival.